Our new deck is complete and ready to be enjoyed! Come experience our new outdoor space with the same amazing views. The new outdoor space consists of a new patio with expansive decks on both sides along with a lush lawn with three firepits. Talk about the ideal hangout spot. The new space provides a distinctive, relaxed setting for guests to enjoy the restaurant’s popular island-inspired cuisine. Enjoy our delicious dining options including daily brunch, dinner, and our fantastic new summer happy hour offered daily from 5-6pm. 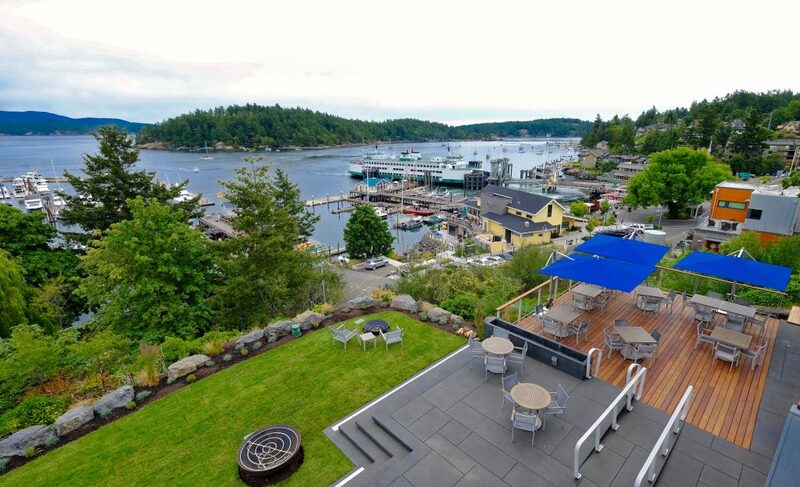 Top it off with breathtaking views of the San Juan Islands. View all of our menus here. Make s’mores on our firepits. Sip on delectable craft cocktails while watching boats go by in the harbor. Revel in stunning island views. No matter how you enjoy it, it’s the perfect place to gather this summer. Along with our new outdoor space, we’ve also expanded our kitchen and added a new wood stone oven to the restaurant! We are FIRED UP about this new addition. From wood fired pizzas and sandwiches to small plates and carefully crafted main dishes, the expanded kitchen and new oven allows us to create even more delicious menu options. Come savor our authentic dining experience that guests have come to know and love. Plus more. Don’t miss all the exciting changes at the restaurant this summer. Learn more about our new outdoor space here.